Last week, Speaker John Boehner announced he would step down as leader of the House of Representatives, setting off a race among Republican lawmakers to become the next top power-broker in Congress. As pundits and media outlets guess at who will take on the role of Speaker, we have another question: who are the candidates backed by? Candidates for Speaker of the House span the political spectrum, but each contender has one thing in common: the bulk of their leadership PAC and campaign contributions come from mega-donors and special interests. That's not a problem that belongs to one party alone. Special interest groups, from big tech companies to healthcare organizations, have also funded Minority Leader Nancy Pelosi’s leadership PAC with checks that dwarf what the average American can give. While we can’t include undisclosed political spending by outside groups in our analysis, our list takes a look at what we do know: corporations are using our democracy to gain influence with elected officials across the country. As Majority Leader for the House of Representatives, Rep. Kevin McCarthy (CA-23) raised more for his campaign committee and leadership PAC during the last election cycle than any of his competitors for the speakership. The single largest source of corporate contributions for McCarthy came from the Altria Group, one of the world's largest tobacco and cigarette corporations. So far in 2015, Hess Corp., another oil and gas giant, has replaced Edison Chouest as Scalise's top source of corporate contributions. In the last election cycle, large contributors to Rep. Jason Chaffetz's (UT-03) campaign and leadership PAC included Home Depot, Best Buy, both of which have lobbied heavily in favor of instituting a tax on Internet commerce. Chaffetz’s largest source of corporate contributions came from Nu Skin Enterprises, a beauty products marketer where Chaffetz worked in public relations before coming to Congress. In his last election, Rep. Daniel Webster (FL-08) received his largest share of contributions from Frontline Homeowner’s Association, with real estate investment firms CNL Holdings and Lee Properties ranking second and third. 5. Air Products & Chemicals Inc.
Rep. Jim Jordan (OH-04), chairman of the House Freedom Caucus, received his top contributions in the last election cycle from Koch Industries and the organization Citizens United. Citizens United, Jordans’ other top contributor in the last election cycle, is known for its 2010 Supreme Court case against the Federal Election Commission (FEC). That’s the case that opened the floodgates to unlimited spending in our elections when the Supreme Court determined that money is speech and corporations are people. Since that decision, political spending by special interest groups and mega-donors has exploded, pushing regular Americans to the sidelines as candidates compete in a race for cash. While candidates in this year's bid for House Speaker relied on wealthy donors and special interests to fund their campaigns, it doesn’t have to be that way. Earlier this month, U.S. PIRG released a report on the dramatic impact that a small donor empowerment program would have on the 2016 elections. Under that kind of program small contributions from regular voters would be matched six-to-one with limited public funds for candidates who agree to turn down large or corporate contributions. That would turn a smaller $50 donation into a sizable $350 contribution, amplifying the voice of average Americans and encouraging candidates to spend more time with constituents instead of wealthy donors. Right now, there’s legislation in the House and Senate that would enact a small donor matching system like the one studied in U.S. PIRG’s report. These bills would put regular voters back in the driver’s seat by matching small contributions at a rate of six-to-one with limited public funds. By amplifying the voice of small donors, a matching system would refocus elections on everyday Americans and give candidates with broad grassroots support a chance to run a viable campaign. You can help pass this legislation by sending a message to your member of Congress urging their support. Small donor empowerment programs are already working in places like New York City; similar legislation has passed in Montgomery County, Maryland; and a small donor measure will be on the ballot this year in Seattle. But we need to get it in place at the national level. Our elected leaders should turn to constituents for support; not oil companies, not the Altria Group, and not Wall Street. 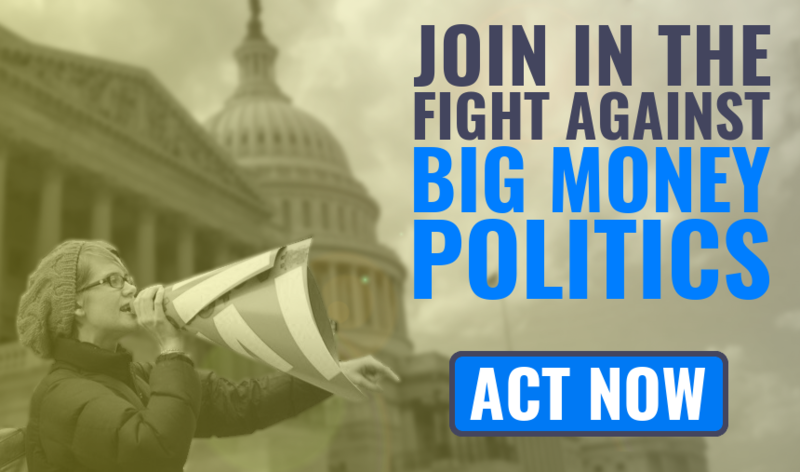 If we're going to change how government works, we'll need you in this fight. Grocer, Stephen. "A List of the Biggest Bank Settlements". Wall Street Journal. June 23, 2015. Dickinson, Tim. "Inside the Koch Brothers' Toxic Empire." Rolling Stone. September 24, 2015. Clough, Rich. "A Crude Awakening from General Electric." Bloomberg. March 12, 2015. Goldenberg, Suzanne. "Secret Funding Helped Build Vast Network of Climate Denial Think Tanks." The Guardian. February 14, 2013.